Dozens of manuscripts belonging to Albert Einstein, many of them unseen in public before, have been unveiled by the Hebrew University of Jerusalem. 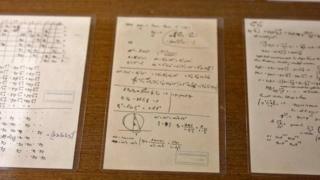 More than 110 new documents are now on display at the university, marking the 140th anniversary of Einstein’s birth. The collection includes scientific work by the Nobel Prize winner that has never been published or researched. It was donated by the Crown-Goodman Family Foundation and purchased from a private collector in North Carolina. The manuscripts contain an appendix to Einstein’s article on Unified Theory that had not been seen since 1930. He spent three decades attempting to unify the forces of nature into a single theory. According to the university, the appendix was thought to be lost. In one note to fellow scientist Michele Besso, Einstein confesses that after 50 years of dedication, he does not understand the quantum nature of light. The collection also includes a letter in which Einstein expresses concern about the rise of the Nazi party in Germany. The new collection joins more than 80,000 items in the Albert Einstein Archives including medals, diplomas and photographs. Einstein was one of the founders of the university and donated his personal and scientific writing to create the Albert Einstein Archives. In 2017, a letter by Albert Einstein in which he grapples with the concept of religion sold for nearly $2.9m (£2.3m).